This is my 500th blog post! Thanks to all my followers and readers. In the post this morning, I received a copy of the translation of my last academic book (before I retired) into Japanese. 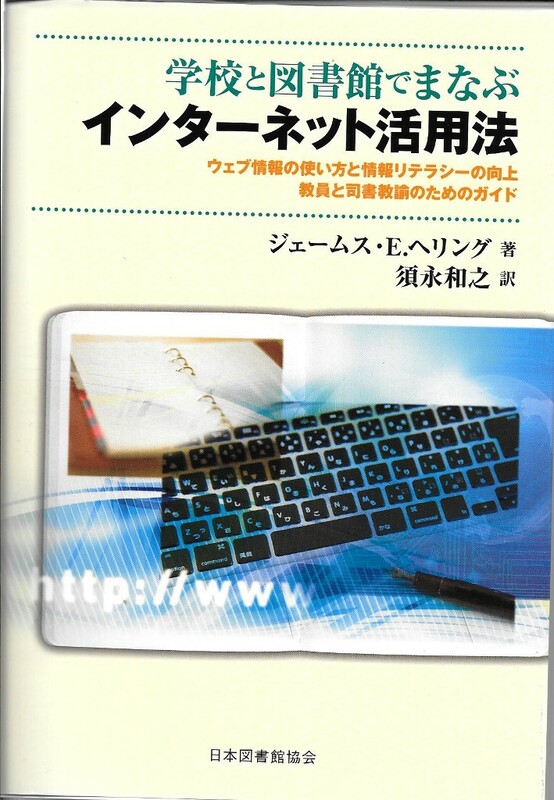 This is the 2nd book I’ve had translated into Japanese, the previous one being Teaching Information Skills in Schools. 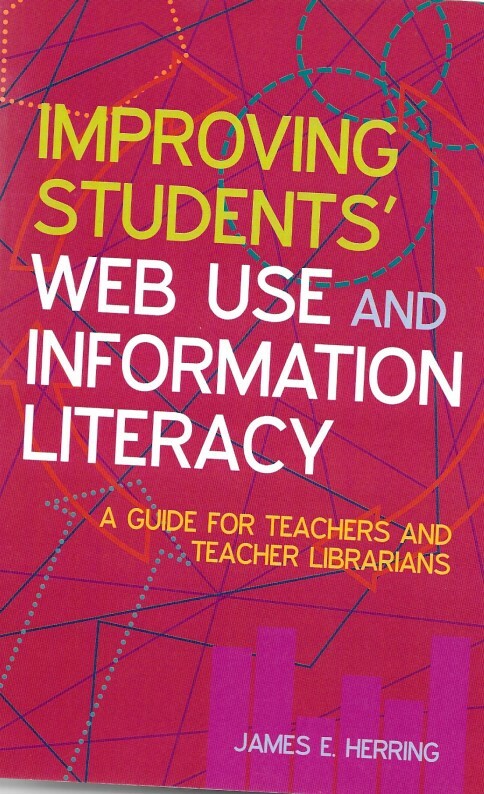 The new translation is of Improving Students’ Web Use and Information Literacy. The book is for teachers and school librarians and has been used in schools and universities in many different countries around the world. It aims to provide school staff with both theory and practical advice – with many case studies of schools – on how to ensure that their students/pupils are effective users of the Web. My own research showed that students were often poor web users i.e. they could find lots of information but struggled to find relevant information for their school work. Developing students as information literacy practitioners implies that students identify a purpose for, find, analyse and effectively use information from a range of sources. It also implies that they will reflect upon and transfer these practices. Yesterday evening I was the guest speaker at the Dunbar and District History Society. 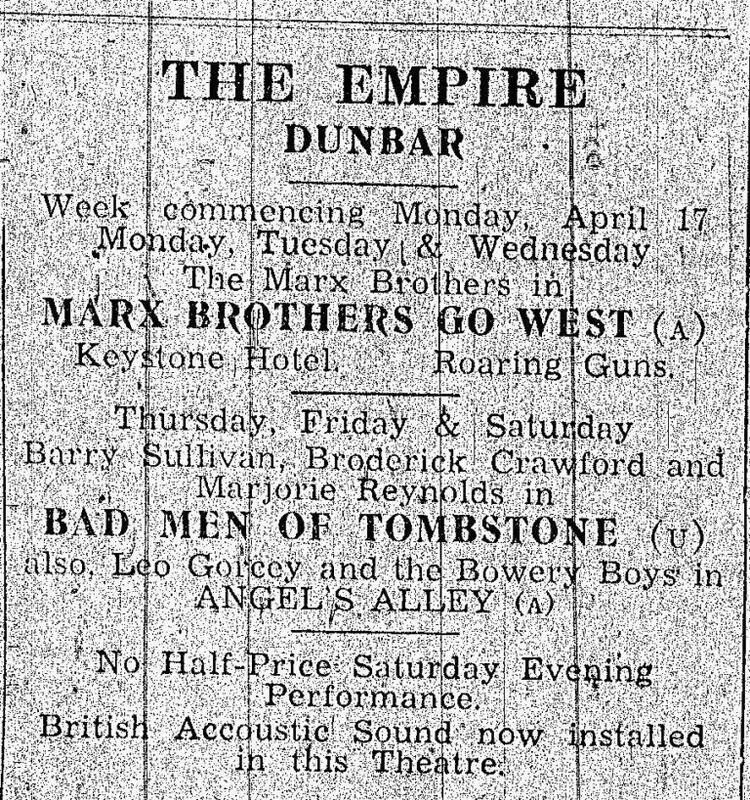 My current research is on my home town of Dunbar in the early 1950s and this talk was on New Housing and Entertainment. 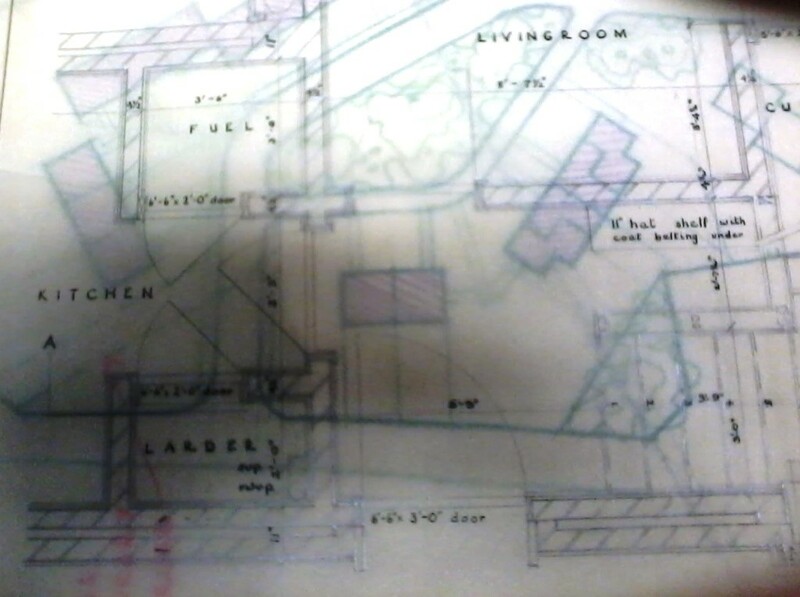 The first topic related to the building of new council houses in Dunbar from 1949-1953. I’m using oral history interviews to record people’s memories of moving to these new houses, situated in what was (and is) called the Tree Scheme, as all the streets were given names of trees e.g. I grew up in Cedar Street. The interviews revealed a phenomenon identified across the UK after the 2nd World War – overcrowding. The postwar baby boom was not accompanied by a housing boom, due to shortages of materials and men, and the poor state of the British economy. As a result, many young families stayed with their parents, usually the wife’s parents. Two of my interviewees lived in small flats with shared toilets, with the parents sleeping in the living room and two or more children in a bedroom. Another interviewee moved from a rented house with only gas light. 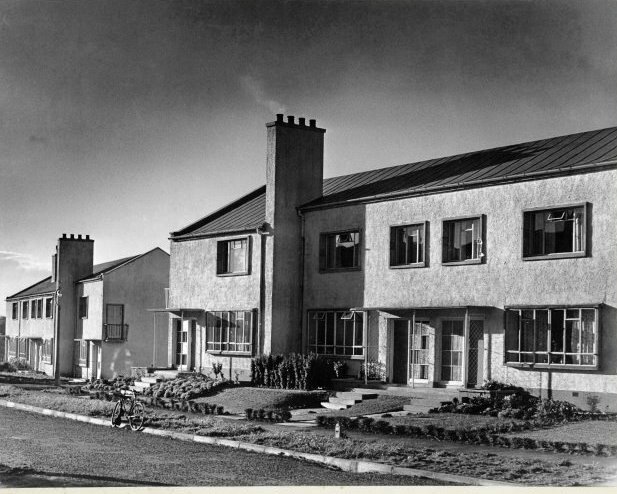 On the whole, young families were delighted with the new houses as they at last had a home of their own, with front and back gardens, inside toilet and bath (as opposed to outside toilet and tin bath), spacious rooms and (by 1950 standards) modern kitchens. My interviewees are mainly children and young adults who moved to these houses. When I interviewed males, the reaction was totally positive. My female interviewees expressed delight for themselves with their new homes, but noted that their mothers’ experiences were not totally positive. For women, who often had several children, the new houses did not provide a release from the drudgery of washing clothes using 2 sinks and a hand wringer and cooking for large numbers. They had much more space but no longer had their mother on hand to help with these onerous tasks. They had to spend long periods in the kitchen. One feature of these houses was that they were heated by coal fires with back boilers in the living room but the coal was not kept in an external bunker, it was stored in a large cupboard in the kitchen. The plan below is not very clear but you can see the word FUEL in the top left hand corner. As you came in the back door, there was a larder, a second storage cupboard and then what was called the coal cellar. For women, this meant that once a fortnight, when coal was delivered, the coal men came in the back door and deposited the coal and created a coal dust storm which filled the kitchen – and had to be cleaned. I asked the female section of my audience whether they thought these kitchens were designed by a man or a woman. You know the response. There was thus a gendered and a class aspect to the design of these houses. The architects – presumably middle class men – were designing kitchens for working class women, so their view of the expectations of the women were, it’s clear, much less than the women’s own expectations. Even in 1950, you would not have chosen to have a coal cellar/space in your kitchen. My second topic was entertainment and although I have recorded interviewees’ memories of listening to the wireless (later called the radio) in these pre-television days and going to local dances, I only covered their memories of the two picture houses (as they were called then) in Dunbar in 1950. The old cinema, The Empire, was a large hall built on a slope, with a narrow entrance. It had been built in the 1920s and was, according to one person ” a pretty dingy place” but it was cheaper. The local paper advertised the films and an example follows. At the talk, I played part of the YouTube trailer for the Marx Brothers film. 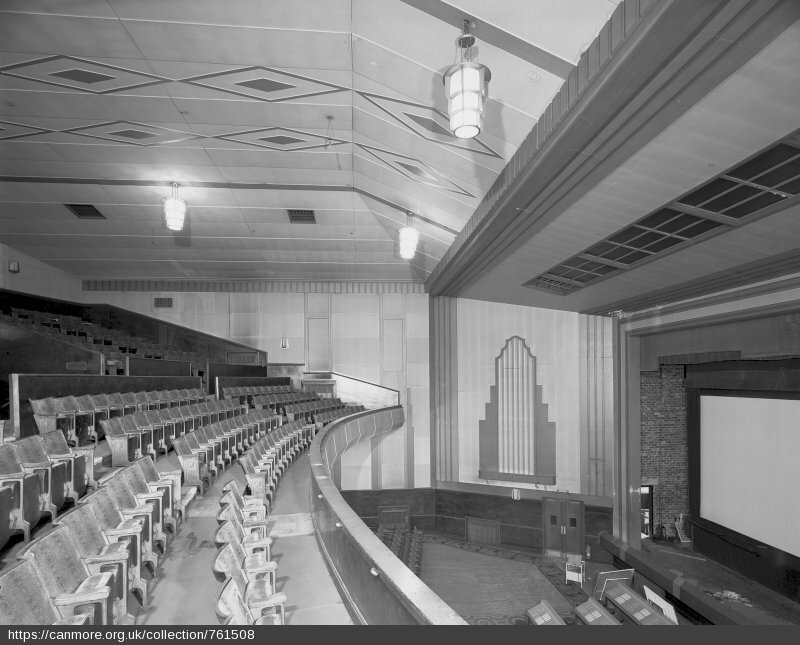 The newer cinema was The Playhouse, opened in 1937 and a much grander affair altogether. It held over 1000 people. One of my interviewees – now a sprightly 90 years old – told me that there was a story that the cinema designers had visited Dunbar in the summer time, when the population swelled because of the seaside visitors and based demand on this and not the normal population – thus the large cinema in a small town. The inside of the Playhouse was decorated in the art deco style shown in the photo below. The Playhouse was much more luxurious than the Empire, with a proper balcony section, as opposed to the rope divider in the old cinema. It also had a café. The Playhouse showed 3 lots of films in one week, plus a Saturday matinée for children, as this advert shows. I played part of the Challenge to Lassie film. It’s Lassie as you never imagined and the accents are awful. My audience enjoyed it as well as the memories of my interviewees who recalled going to the Playhouse on a regular basis. 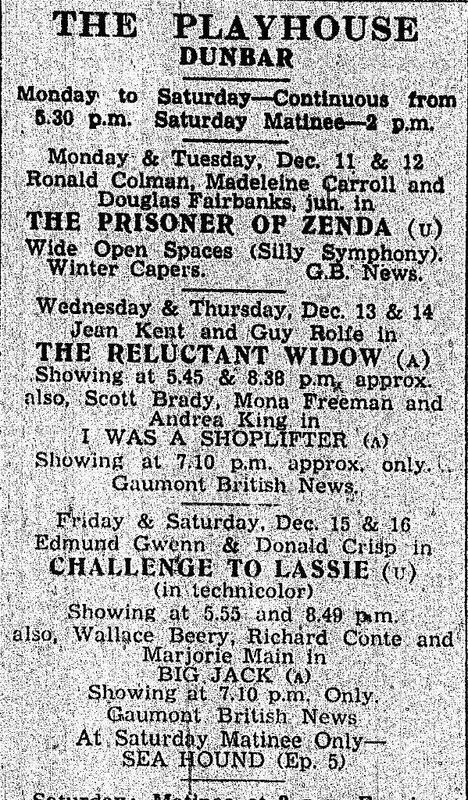 In the advert above, you will see that, at each showing, there was the Gaumont British News. This was the only way that people could see the news in 1950 as television did not come to Scotland until 1952. This entry was posted on February 11, 2016 at 5:24 am and is filed under books, buildings, Dunbar, education, Films, history, Information literacy, local history, Radio, Sources for TLs, transfer, TV. You can follow any responses to this entry through the RSS 2.0 feed. You can leave a response, or trackback from your own site.